“Moonlight” is altogether a challenging yet simple film; it's beautiful, lyrical, and ultimately moving. It will certainly mean different things to different people, which makes it a simply stunning cinematic achievement. The film forces us to look past the skin color of its characters; it's a universal story about humanity, growing up, the need for connection, and finding one's own identity. Comparisons to Richard Linklater's brilliant “Boyhood” are not unfounded. They are similar in conception but worlds apart in execution and characterizations. “Moonlight” tells the story of a poor African American named Chiron told in three acts: as a shy child, an introverted teenager, and as a toughened man. An important film for this day and age, it's absorbing and sobering filmmaking of the highest order; fascinating direction, stunning performances, and is so captivating that no two film-goers are likely to have the same experience watching it. “Moonlight” is the story of Chiron, a black boy growing up in a poor neighborhood in Miami, Florida. He's first played by child actor Alex R. Hibbert as an introverted young kid who doesn't always fit in. It certainly doesn't help that he's significantly smaller than his peers and is non-so-lovingly called “Little.” His poor, drug addicted mother Paula (a wonderful Naomie Harris) pays less attention to him than the school bullies. She's too busy trying to find her next score. Sanctuary takes the form of a local drug dealer with a heart of gold named Juan (Mahershala Ali) who with his girlfriend takes the boy in, feeds him, and gives him more care than his neglectful mother ever could. 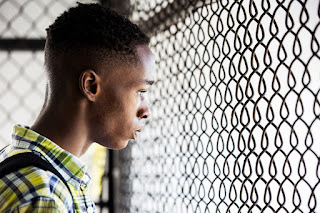 As a teenager Chiron is played by Ashton Sanders who gives arguably one of the finest performances in the film. Sanders nails the characteristics established by Hibbert; his Chiron is still introverted, small, tepid, and struggling to figure out who he really is. Bullying has not remotely gone away and has reached a threshold. His sanctuary remains at the home of Juan and his girlfriend who by now are like surrogate parents. Chiron also finds an unexpected closeness to his buddy Kevin (Jharrel Jerome) which will continue to shape the course of his life. As a grown man – but still not fully satisfied with who he is – Chiron (now played by Trevante Rhodes) is still the same introverted personality even if he's become “hardened” by an unexpected life path. He will then make an unexpected connection with someone from his past though the viewer isn't privileged to see it all. And hence the brilliance of writer/director Barry Jenkins. Like, “Boyhood” we get several glimpses into the life of a young man as he grows up. Chiron's story will certainly not reflect everyone's own life – and that's not necessarily the point. We get to see the story of a person so rarely portrayed onscreen and yet his ultimate struggle to fit into his world feels empathetic and relateable. Jenkins fills the frame with beautiful imagery; his camera whips around and in some moments is appropriately still. Jenkins' script is fascinating based on what he decides to show us – and not show us. He gets impressive performances from his ensemble and while the film is based on a play (“In Moonlight Black Boys Look Blue”), the movie feels cinematic and play-like all at once. Trailer for Moonlight on TrailerAddict.